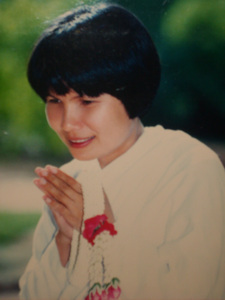 Maha Upasika Dr. Bongkot Sitthipol was bom in Aranya Pathet (now Srakaew Province ), Prachinburi, Thailand . She was the owner and teacher of Sremsuoy Bongkot School , a beauty salon school certified by the Thai Ministry of Education. At present she is the Dhamma Master of Dan Mahamongkol, a meditation center for women as well as men, located in a forest setting in Kanchanaburi along the famous and picturesque river Kwai. Maha Upasika Bongkot Sitthipol, Mother in the Dhammaland, as her disciples know her, is the president of several centers and foundations for meditation, as well as forest protection and restoration projects. She is the founder of Dan Mahamongkol in Savatthi, India, a great tribute to Buddhism. While she led her secular life, she observed that life is impermanent, subject to birth, old-age, sickness and death. Eventually, she reached the decision to renounce the world. Following the footsteps of Maha Kassapa Thera—the close disciple of the Buddha praised for his pilgrimage practice (Tudong), she made pilgrimages for the sake of Dhamma all over Thailand including in Aranyapathet, Prachinburi, along the Cambodian border, in Khao Kho, Doi Tung, Phu Vuew, along the Laotian border, in forests in Thong Phaphum, Kanchanaburi, and along the Burmese border. Recently in 2003, she completed her pilgrimage along the historic sites of the Buddha in India, followed by her 1,000 disciples. She has taught Dhamma to more than 10 million people from over 100 countries. She has devoted herself to teaching Dhamma as well as to reforestation and forest protection projects as an expression of her loving kindness to save all beings spiritually and physically, not only in Thailand , but also in India and the rest of the world.